Ligia port cat family in their new home! They were born in Ligia port , grew up in a boat. 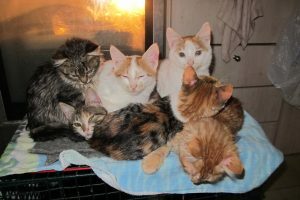 They are adopted the six brothers AND their mom!!!! Giorgos travelled from Germany to Greece, in order to adopt a Lefkas stray…. He saw “Rey”, Rey looked at him…. and they fell in love! 6 angels dumped in Paradise! THIRD TIME LUCKY for Alfredo.. After not being wanted in his first home, then fostered, he has now found someone who wants to keep him! Just look at the photos! Woody will be happy ever after… Buy buy darling! We were so happy we met you…. A home wanted for Alfredo! She was found 2 years ago in the Platistoma area, hungry and exhausted.Ever since ,she has been loved and looked after by members of LAWS but unfortunately they cannot look after her anymore. They are 4 months old and they are probably a mix with German Sepherd.They were found dumbed in the bin and although they had a bad start in their lives they have become to be two adorable,obedient and friendly puppies. Support us with a donation!